Click flag to change currency. Would you like contacting if or when heart-pendant-collection becomes available again?" Jewellery is so personal, it is easy to go wrong. So how about this for ease? A simple stone heart shaped pendant is classy classic and cute. What will it go with? 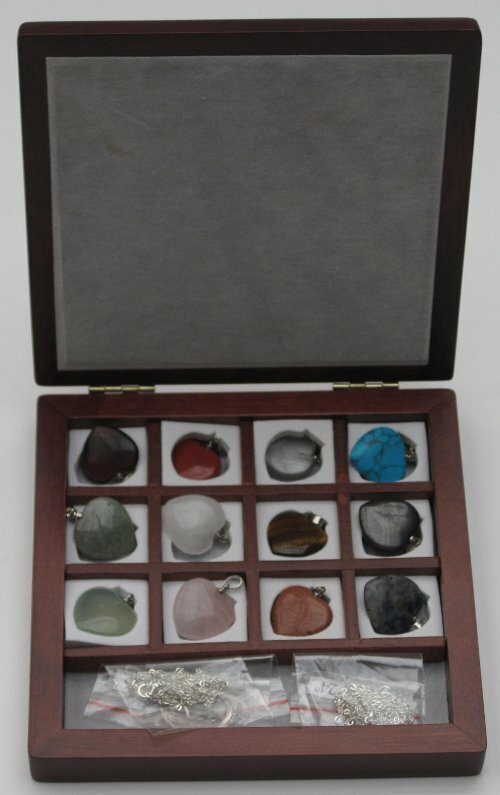 For £0.00 you can have 12 different stone heart pendants going with everything and anything and do no wrong. Red Jasper, New Jade, Rose quartz, sodalite, tigers eye, goldstone, simulated crystal, simulated amethyst, turquoise, heamatite, aventine, blue lace. All crafted into hearts by expert stone cutters then polished and buffed to bring out the beauty of each stone. AND a solid wooden jewellery case with felt lining and base, and an 8 inch bracelet, 16 and 24 inch necklace. The heart pendant collection is lovely and will be loved, as will you if you give it as a present. Heart Pendant Collection text, images and video are copyright.